If you can wear it, and it's not exactly clothing, it could be a Sonic Accessory! Thanks to Segaworld, Australia started off with a nice selection of Sonic themed character accessories like slippers, hats, and more. 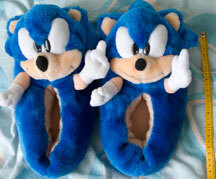 Everywhere seems to have produced a pair of Sonic slippers, regardless of the result. 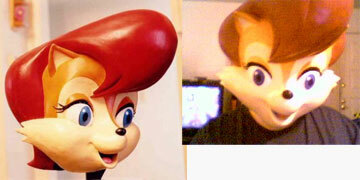 These from the Australia SegaWorld, have 3D sewn-on plush heads. The likeness is very 'cartooney' with big attached eyes and a 'front style' mouth that is not quite characteristic of him. The result here though, is at least semi-cute unlike a few other slipper-disasters which can be found about the site. A hat or cap is a popular souvenier. Naturally, Segaworld of Sydney had several on offer. 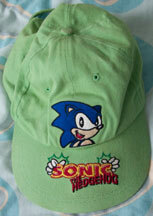 This is a rather bright green cap, with embroidered design. 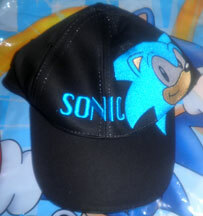 Sonic's head and torso are on the top of the hat, but his name and hands are on the brim. Interestingly, this stock-art like image has the mouth open, which is a bit unusual. It's made to look like Sonic's hands are 'popping out of' the brim, to hold the name/logo. Due to the construction of the hat, the hands are a bit far to look like they are 'attached' to the above torso, but the effect is still interesting. Yet ANOTHER pair of Sonic house-slippers. 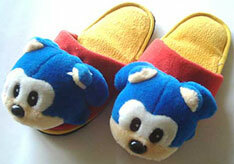 Strangely, Sonic slippers were produced several times in many areas. Australia had them too, this time at Segaworld. This pair is a bit plush-like in that it has hands, one with a pointing finger. The 'belly dot' is kept peach, and is obviously where the foot goes, but this type of thing always borders a bit on 'strange' because really you're stepping into the character which is just odd. The distinguishing feature here is that the pupils for the eyes are sewn QUITE close together, giving him a very 'concentrating' look. His spikes are toward the ground, so not quite sure how that works with wearing these around the house. 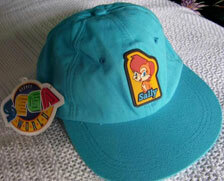 Here's a red cap from Segaworld. It features Sonic, Robotnik and Tails. The interesting thing is that Tails is beginning to mutate, even here in Australia. More brown than orange, a big nose, tiny ears and to top it off, he's mad! This cap needed to watch the art better, as Sonic also has a bent eye. Robotnik is looking appropriately schemeing, though his head is somewhat banana-shaped. 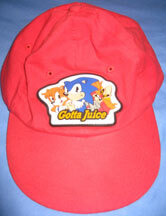 Drawing from the SatAm Sonic show, it features the "Gotta Juice" phrase as a motto. Photo by: Rhia. Now HERE's a rare look at something! tons of official merchandise with her on it, Sally-only items, and even a mascot suit of her. This mask is actually pretty much amazing. The likeness is REALLY good considering it's basically hollow rubber. She's not scary, mutant or absurd. It looks like the character from the show. See the notch in the edge? These may be meant to hold an identifier card of some kind that fits inside. 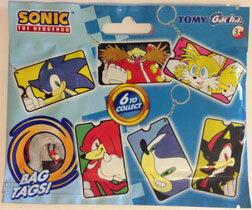 While it says it's a 'bag tag', it's likely it could be used as a keychain unless they're huge. These may have only been sold in Australia. Does anyone actually own one of these to see how big it is? 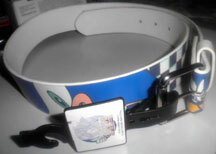 Here's a 'deluxe type' dog-tag necklace that was a SegaWorld Sydney exclusive item. A usual 'dog tag' is just a flat metal oval shape with whatever words/designs pressed in. 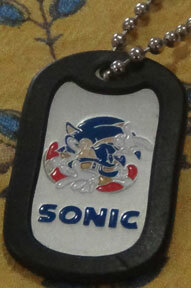 This one is deluxe because it uses 3 colors of enamel in the pressed in design for SA1 style Sonic & his name. Also, because it has an added black rubber bumper around all the edges & hole to make it more comfortable to wear / take away the harsh edges. It is on a standard/normal beaded metal chain (as is expected of such tag necklaces) Because SW Sydney closed not long after, this is a later item for them, but with 'wierd walkin' Sonic' it's a very early SA1 piece. (As that stock art fell into disuse because it was a bit odd) This was bought around 2000. 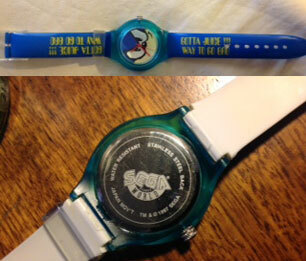 This is a watch from Sega World Sydney, in 1997. It's an analog type, with red hands & the face is literally Sonic's face. There are no numbers, so the big forward-facing face is the only design. The band is plain blue, but has 2 slogans in yellow. The first is "Gotta Juice!" and the other "Way To Go Bro!"